This painting was selected for and sold at the National Exhibition of Wildlife Art (NEWA) 2011 (sold preview evening). White Helleborines, Cephalanthera damasonium (previously Cephalanthera latifolia), Chiffchaffs, Phylloscopus collybita. From July 2011 to December 2014 this painting was available as a Whimsy Jigsaw Puzzle by Wentworth Puzzle Company, catalogue no. 602506. PAINTERS ONLINE FAVOURITE IMAGE: “I am writing to let you know that one of your paintings from the gallery at painters-online.co.uk has been chosen by the team as one of their favourite images added during July. As such the image will appear in a special panel on the home page of the site for the whole of August, and also on the page Gallery Images 2011. Congratulations on having your work chosen. An invitation to a friend’s wild garden to draw White Helleborines en plein air could not be refused. 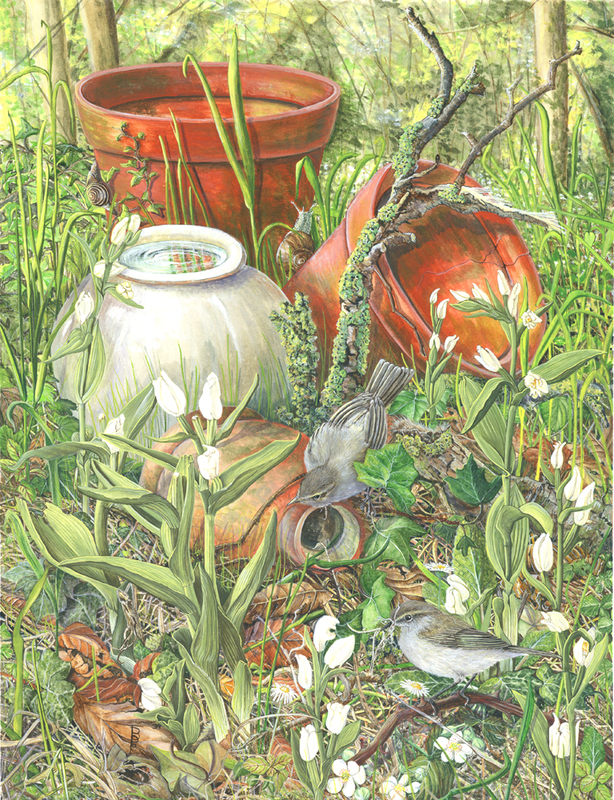 I packed up drawing materials in May 2010 and sat amongst these beautiful flowers in the late evening sun, with chiffchaffs flitting about amongst the undergrowth, and trilling their unmistakable ‘Chiff-Chaff, Chiff-Chaff’ all around me. 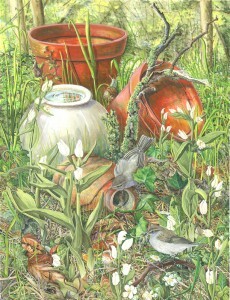 It was such an enchanting scene that, along with discarded pots tangled in the undergrowth, a composition was born. I was allowed to pick a couple of stems, to help me with the fine art drawing. I wanted to portray chiffchaffs in a natural environment. Although it looks as though the bottom bird is being encouraged to make a nest in the pot, this probably would not happen, as Chiffchaffs usually nest on the ground, making a sturdy ball nest of grasses and mosses. They are reasonably safe from predators because they are very shy, unobtrusive little birds (when they are not singing that is!). Many thanks to Valerie and John for access to the Helleborines. The Chiffchaffs flit before my eyes!